The Land Registry House Price dataset uses repeat sales regression on houses which have been sold more than once to calculate an increase or decrease in price. As it analyses each house and compares the latest buying price to the previous buying price it is by definition mix adjusting its data also. This is then combined with a Geometric Mean price which was taken in April 2000 to calculate the index. It is seasonally adjusted and covers properties from England and Wales. It covers buyers using both cash and mortgages. 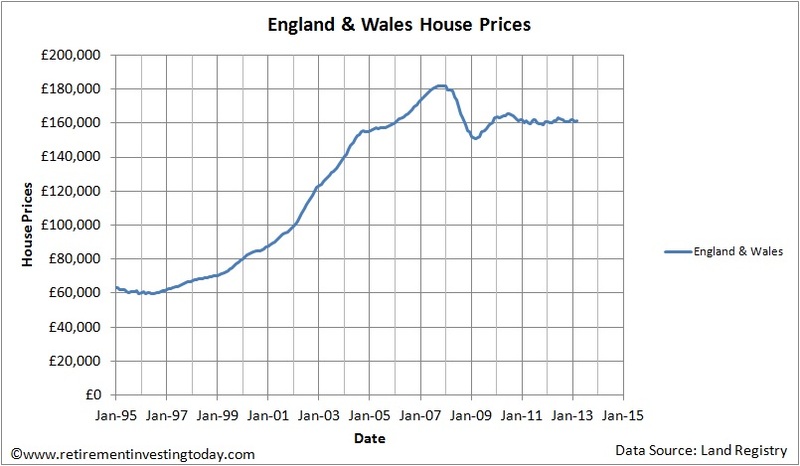 If we look at April 2013 for all of England & Wales it tells us that house prices were £161,458 which month on month is an increase of 0.4% and year on year is an increase of 0.7%. If this was published in the mainstream media readers would think house prices are still rising. The chart below then plots the complete Land Registry dataset for England & Wales since January 1995. Analysis of this chart would make readers think that prices weren't in fact rising but had actually been stagnant for a number of years now. This however really doesn't tell the full story. 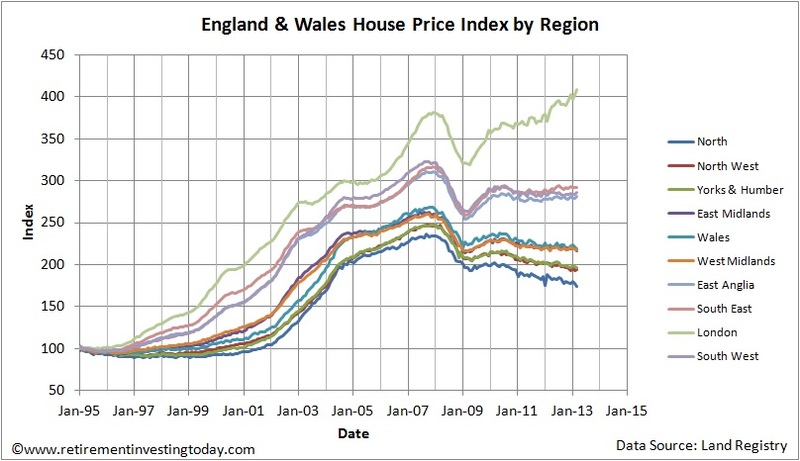 Cutting the data by Regional House Prices reveals the chart below. To enable some analyse of this regional dataset let’s convert each region into an Index that starts at 100 on January 1995. Now we’re getting somewhere. England & Wales House Prices can now be characterised by 3 distinct regional variations. London is a law unto itself with prices up 400% since January 1995. They also look to be continuing to head northward. The House Prices of the South East, South West and East Anglia have stagnated with prices up 280-290% since January 1995. House Prices are then falling, and have been for some time, if you’re in the North, North West, Yorks & Humber, East Midlands, Wales or the West Midlands. 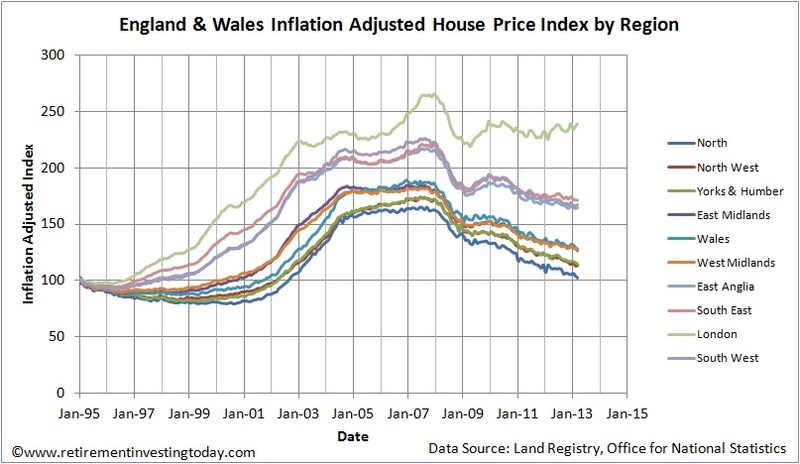 Let’s now account for the devaluation of the £ which comes from inflation to create an England & Wales Inflation Adjusted House Price Index by Region which is shown below. This shows that the house price crash is actually happening unless you’re in London. 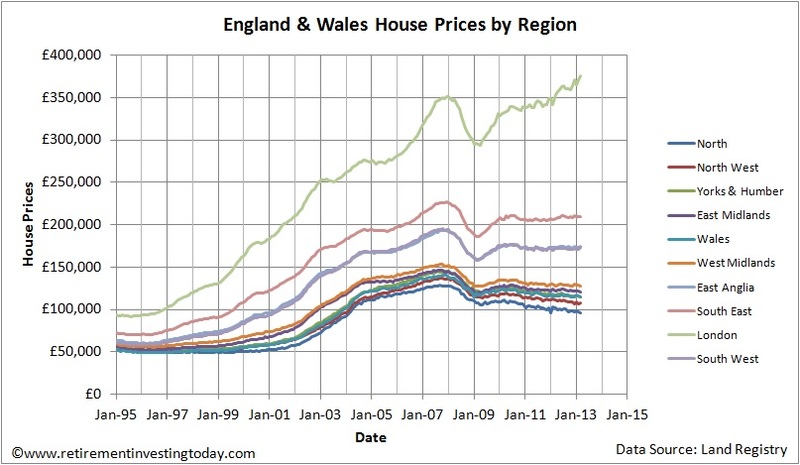 In fact house prices in the North are now back to what they were in January 1995 if measured in non devalued £’s. So we've gone from house prices are rising to house prices are crashing in the North. It just goes to show there are lies, damn lies and statistics in this modern world.